The meteorologist in charge for the National Weather Service's southeast Louisiana office says at least seven tornadoes have hit southeast Louisiana and southwest Mississippi. Ken Graham says that number includes the one that slammed into a trailer park in Convent, Louisiana, Tuesday and one that killed a person near Purvis, Mississippi. Graham said teams will be sent out in the morning to document the damage and rate the tornadoes. Severe weather has been moving through southern Louisiana and Mississippi. At least three people have been killed - two in Louisiana and one in Mississippi. Graham said a lightning strike hit the building where the weather service is located in Slidell, knocking out their radar systems and forcing them to go to backup systems. A Louisiana sheriff says a second person is confirmed dead after a tornado ripped through an RV park. St. James Parish Sheriff Willy Martin says at least two people were killed when the twister hit the park in Convent. He said authorities are using dogs to search piles of rubble left in the wake of the storm to find anyone else still missing under the debris. Martin said at least 30 people were wounded. Of those, seven are in critical condition. The tornado was part of a line of severe weather that has been moving through southern Louisiana, wreaking havoc across the region. The sheriff of a southern Louisiana parish where a tornado is believed to have touched down says at least one person is dead at an RV park. Sheriff Willy Martin, speaking on local television, says there was one fatality and possibly may be another victim at the recreational vehicle park in Convent. Martin says authorities are still looking for people believed to be trapped under the debris. He said he could not give an accurate number of people injured but that he saw at least 25 people with injuries - some who were able to walk out while others were more severe. The reported tornado is part of a line of severe weather and storms that has ripped through Louisiana. Authorities say at least one person has died after a possible tornado touched down in Mississippi. Vann Byrd of the Lamar County Emergency Management Agency says the death occurred Tuesday in a mobile home west of Purvis. Byrd didn't release the person's name. Byrd says officials are still sorting through reports of damage to some buildings. David Cox, a meteorologist with the National Weather Service in Pearl, Mississippi, says forecasters spotted debris on the ground on Tuesday afternoon that is a typical hallmark of a tornado. Storm damage was also reported at a second location in the county that appeared to be caused by the severe storm system. The owner of an RV park in Convent, Louisiana, says he believes a tornado tore through that area and that several people are injured and numerous recreational vehicles are destroyed. Mark Anderson, in a telephone interview Tuesday with The Associated Press, said trees are toppled over and only about six to eight trailers at the Sugar Hill RV Park are left standing. Local news and television footage showed dozens of other trailers lay crumpled, flipped on their sides or pushed into or on top of other mobile homes. Authorities say there are reports of people possibly trapped in some of the trailers or under debris. The St. James Parish sheriff didn't immediately respond to a request for information. Richard Zuschlag (ZOOSH-lahg), chairman and CEO of Acadian Ambulance Service Inc., says ambulances have taken eight people to hospitals from houses in Convent, but fallen trees have kept them from reaching the damaged trailer park. More than a dozen public school systems in south Georgia are closing as forecasters predict severe storms could threaten the region overnight. Schools in Valdosta and surrounding Lowndes County will be closed Wednesday, as well as 12 other school systems in rural south Georgia counties. Officials say schools in some other districts plan late openings Wednesday. The National Weather Service says south Georgia faces a threat of violent storms and possible isolated tornadoes from Tuesday night united Wednesday morning. The same storm system caused early school closures Tuesday in districts in Louisiana, Mississippi and Alabama. An emergency management official in west Alabama says a storm has knocked down trees and damaged at least one home near the rural town of Reform. Ken Gibson, emergency management director in Pickens County, says no one was injured in the storm Tuesday. The National Weather Service tweeted that radar showed an apparent twister in the area around the time the damage was reported, but Gibson says he isn't sure what had happened. 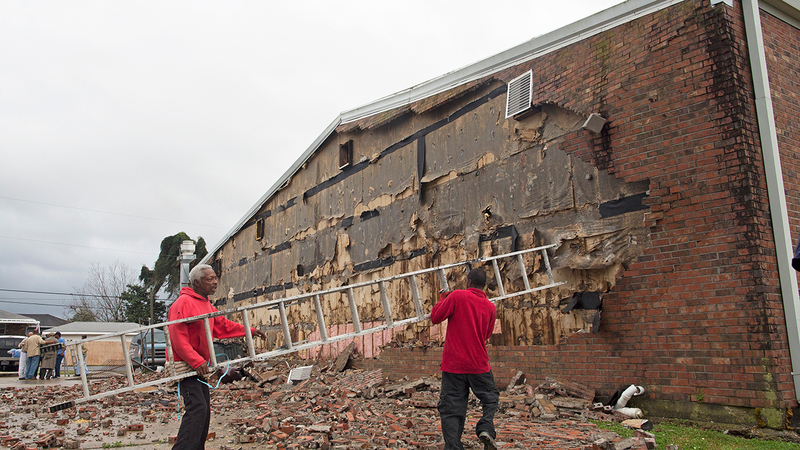 "I don't know if it was a small tornado, straight-line winds or a microburst," he said. Alabama Gov. Robert Bentley has issued a state of emergency because of severe weather approaching his state. The declaration released Tuesday means schools won't have to make up any days lost because of the storms. It also directs emergency management officials to offer any assistance needed because of severe weather. Bentley's action came after the National Weather Service placed southwest Alabama under a tornado watch. Storms moving toward the state already have caused damage near New Orleans, where a possible tornado touched down. A flash flood watch covered central Alabama, where forecasters said as much as 2 inches of rain was possible. The weather service issued an advisory saying winds up to 40 mph were possible in the Tennessee Valley region of north Alabama. Mississippi Gov. Phil Bryant has issued a state of emergency for all areas of his state that may be affected by the approach of severe weather. A severe storm system with potential for strong tornadoes, damaging winds, hail and heavy rain, is expected to cross Mississippi through Tuesday night. Bryant's office says the state of emergency is an administrative tool that allows local governments to request state assistance to help with response and recovery associated with any storm recovery. The Mississippi Emergency Management Agency said it was monitoring developments and would provide updates as information becomes available. Emergency officials and the National Weather Service say a suspected tornado spotted near Louis Armstrong New Orleans International Airport apparently touched down in a field near a suburban neighborhood. It was part of a line of severe weather passing through Southeast Louisiana. It is believed to be one of many wind storms and possible tornadoes that erupted Tuesday around the greater New Orleans area, including possible sightings north of Lake Pontchartrain and west of that city in St. Charles Parish. There were no reports of any injuries, but wind damage to homes and businesses has been reported, according to officials in Jefferson Parish where the airport is located. There were reports of cars damaged at a parking lot near the airport. The powerful storm system is expected to bring heavy rain, winds and possibly some snow to parts of Arkansas. The National Weather Service in Little Rock says southeast Arkansas could get 3 inches or more of rain, while the Ozark and Ouachita Mountain areas could see 1 to 3 inches of snow on Tuesday night and Wednesday morning. A high wind watch is in effect for central and northeast Arkansas from 6 p.m. Tuesday until Wednesday afternoon. National Weather Service forecasters are urging people in the central area of North Carolina to brace for possible severe weather later in the week. Forecasters say straight-line wind gusts are possible Wednesday and could cause damage. The weather service also says that with the system bringing severe weather expected to move across central North Carolina during school hours on Wednesday, schools and universities should take time to review their severe weather safety plans and review their tornado sheltering procedures. Storms in South Texas have left thousands of people without power and windows broken after hail the size of golf balls damaged some buildings. Dispatcher Ana Amescua (AH'-nuh uh-MES'-kwah) says hail the size of golf balls and larger broke windows throughout Brackettville - including at the town's schools. Administrators canceled classes Tuesday in Brackettville, 30 miles east of Del Rio.